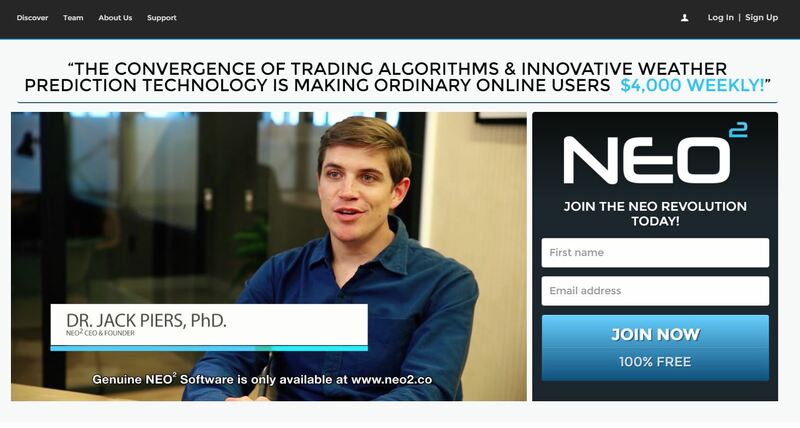 In this review we show proofs that “Neo2” is a binary options scam. It is presented by Dr. Jack Piers, PhD. Piers says that Neo2 is a trading software that predict trends with weather factors, it combines binary options trading with solar tracking. The software allegedly has a 85% winning rate and it can make you $4,000 per week. Neo2 will allegedly cost $7,900, but now you can get it for free as a beta tester. The Neo2 presentation is so packed with lies that we even cannot go through all of them. If it was not a scam, it would be very funny. Predicting binary options trades with solar eruptions is one of the most stupid things we have ever heard. The presentation is made with paid actors and one famous binary options scammer. At the beginning of the video you can see quotes about Neo2 from media like the Wall Street Journal or Washington Post. But these media have never mentioned this system, look at the picture, or you can do your own research. But this is not the only fake. 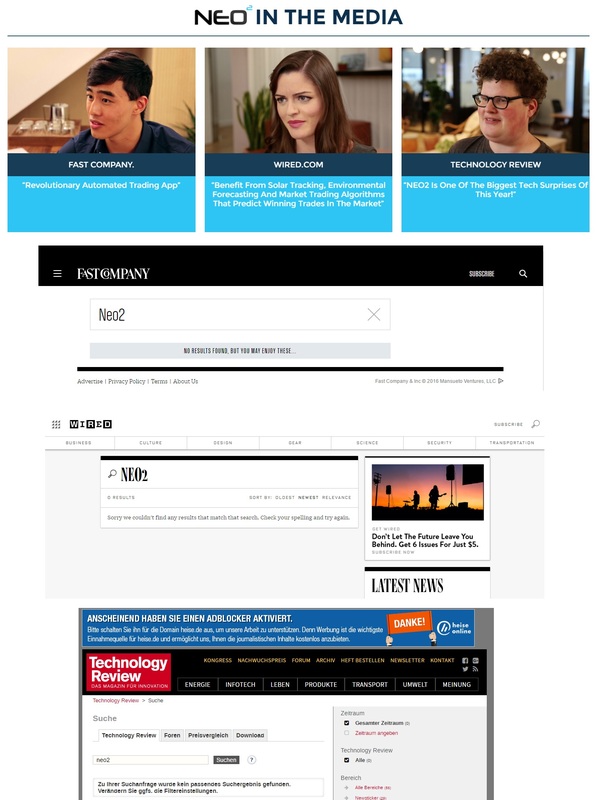 On the Neo2 web site you can see video reviews allegedly made by people from Fast Company, Wired and Technology Review. 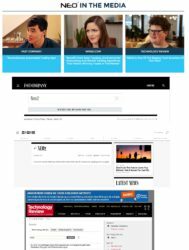 But it is all fake, these people have nothing to do with these web sites, none of them has ever published a review of Neo2. You can again see the proof on the picture or do your own research. In the video you can see Michael Freeman endorsing Neo2. But Freeman is one of the biggest binary options scammers, his BinaryOptionsWatchDog and other web sites are promoting scams with affiliate links. He is publishing a lot of fake reviews. And he already has a miraculous and free trading software called Mike’s Autotrader that is producing millionaires, so why another one? In reality these are all scams. In the video you can hear the usual lie used by scammers. They say that you won’t need your credit card, that it is free. But in reality the first thing you will have to do after joining is to deposit at least $250 with their broker. Because this is the purpose of their scam, they will get paid for every new depositor they refer to their broker. So you will have to deposit and risk your money with a software that you could not test on a demo. And be sure that this software will lose your money. When we first saw the Neo2 app, we immediately recognized the most used software by binary options scammers. Look at the picture, they slightly altered the layout, but it is absolutely clear that it is the same app as used by many scams. People are losing money with this software, we have a lot of feedback about this. Neo2 is a pure scam. It is abusing binary options to take money away from you, so don’t sign up! If you want to try binary options risk free, do it on a demo account. There you will see that you need to learn trading and build a profitable strategy in order to make money. Avoid all the scams promising you free money and asking you to deposit first. Neo2 is without a doubt a scam, by association with known scammer and common crook Michael Freeman, who, having failed to scam people with his own dud software have resorted to team up with other aspiring scammers to con people out of their hard-earned money, first with a couple of pseudo Russian scientists to flog their joint-venture scam Gold Digger, and now with this weatherman. So I am duty-bound to warn traders of this new scam. Beware! Beware of anything associated with this common thief and thug, Michael Freeman! What you say would make sense. but one thing doesn’t yet equate for me. Why are all the binary option YouTube bloggers, and without exception, apparently getting 80% wins when they use the AutoTrade funtion of this app? And there ARE a lot of them posting. Any ideas on this? Thanks! Because they are affiliated with these scams, they promote them with affiliate links and they are getting paid for every new victim they refer to these scams. This is how you get tons of fake reviews, fake account sreenshots and so on. Most laudatory comments were posted by the affiliates of that common thief scoundrel, Michael Freeman; others were posted by the scu*bag himself! New alert on Neo2, the latest scam concocted by the low-life scammer and thief Michael Freeman: After an unsuccessful career as a fake watchdog, a dud signals provider and a vender of a variety of dirty scams, this common crook had decided to bolster his faltering fortunes by joining force with more successful scammers. First he recruited two fake Russian scientists who own the Gold Digger scam, and now he has added to his team a weatherman, Jack Piers, who claims to be able to predict movements in the currency market with software for weather forecast, what a bad joke! To reinforce my suspicions about this motley mob of crooks and villains, it has just come under my notice that the “recommended” brokers used by these scoundrels are mostly notorious scam brokers, in particular, UK Options, led by a shameless liar and conman, Sean Park. As the old saying goes, birds of the same feather flock together. So here you have it, a gang of unscrupulous thieves and crooks putting their filthy heads together to work out ways to deceive the public, corrupt the industry and rip off those hard-working people who can least afford it. At last an honest review I feel. I started to doubt and alarm bells sounded when they directed me to Bloombex Options broker (for Uk ). They are a terrible, unlicensed broker yet I’ve been reading reviews saying neo2 only use registered brokers. Pah! I found many Youtubers/bloggers showing their great results with Neo2. I kept thinking, how can they manipulate their great results? So I tried out Neo2. After 2 days, I am 2-7 :(( I asked one Youtuber why my results were so different than his and I have the same broker as he does? The answers were “The software isn’t synched properly” or “maybe try a different broker”. What a scam! Hi Valerie would you be so kind to post your experience on my video to help warn others about this software? I would greatly appreciate it. Look at your payment, ask the payment processor where did the money go. Well after watching all the u tube videos of all the mostly brilliant itm results with neo2, I took the plunge and signed up. Well my account balance of $250 is now at $0.00 after 3 days the software had only 1 win and the rest were all losses. I would also warn you good people about Binary Tilt as a broker, watching live my trade was well itm then when validating it was a loss how? Once this happened I applied for a withdrawal of the rest of my capitol 20th April and i’m still waiting for it. Beware and if someone can point me in the right direction of a reputable signal giver and broker please reply. I also signed up for the beta, based on the recommendation of two friends who had signed up. They usually are very careful about money issues and do their research, but I found out AFTER I had signed up that they rushed into this wanting to get in early on the beta test. I deposited $500 and my “broker” (SecuredOptions) and the software have all lost bets. The only think keeping me afloat is the bids I made and won. I currently have $471.50 of my $500 left, plus the $427.09 SecuredOptions deposited in my account as two bonuses (for what, I have no idea). I’ve just requested they reverse the charges on my credit card (for $471.50). If they crash their heels on this, I will be contacting my credit card company and requesting a charge-back and reporting them as fraudulent. You have to dig deep to find the truth about these guys ad they have so many fake sites giving them good reviews. Beware folks! I sensed something was not right about this. Isn’t it logical that the brokers may be on the other side of these trades? I know this happens with forex brokers. The only thing I am finding is that this bot and broker is making us broker. I suspect the broker may be scalping my account by taking the other side of the trades and fixing prices. Any thoughts on this possibility? I feel dumb now because this entire concept plays off of people’s emotions and market psychology of greed! Really absurd. Unregulated brokers can do all sorts of things, but the first problem here is that Neo2 is a scam, the software cannot trade profitably. would like to hear some comments about BINADROID or is this also a SCAM? Mr Gold now with X Options…..I am interested in the BINADROID,problem is to FIND an HONEST Broker ?????? On 8th April, I was directed to a Binary Trading entity SecuredOptions by signing up ignorantly with an automated trading software called CopyBuffet. Within minutes of opening and placing a deposit of $900 in the trading account, I received a call from a phone operator from SecuredOptions. As it was the weekend, the operator informed me that my account manager will be talking to me the following Monday. Sure enough, come Monday, a James C. Bennet who claimed to be the trader assigned to manage my account, rang me up. James talked, inquired and dig deeper into my financial status and convinced me to pump in another $5,000 so that he can show me his capabilities to make money. Thus, we started this so called Account Manager/Client relationship with $8,793.50 starting fund (I traded and made some profits over the weekend). Over the course of the next 2 weeks, James made a series of 5 trades with 100% winning streak and brought the account up to $11,358.50, bringing a handsome profit of $2,565 or 29%. At this juncture, he assisted in a $1,000 withdrawal back to my credit card which was received within 3 days, in order to prove that the withdrawal process is totally legit. In addition, he kept selling the idea of getting me into a VIP trading group, managed by a Ben James, which promises higher returns with lower risk. The minimal entry to this group is a $100,000 injection from my end. When he learned that this is beyond my financial status, somehow, he said that the company will make an exception for a valued client like me, and will allow entry with just a $50,000 injection. He managed to hypnotized me into injecting an additional $10,000 while we brainstormed along the way on how to come up with the rest of the money. At this point, my total “investment” stands at $15,900. 5)	Selling my car etc. As we are exploring the possibilities along the way, he continued to execute another big winning trade and brought the account up to a nett $23358.50 (minus away the $1,000 withdrawal). At this point, I made it very clear that with my current financial status, $15,900 is the maximum I am willing to risk for the next 6 months. In addition, I will start to make regular withdrawals from the trading account. That is when things started going downhill. The next trade that was placed after this conversation was $3,000 on GOLD. And it was a loss, ending his 100% winning streak for the past 6 trades. The account was down to $20,358.50. We had another conversation and I made it very clear to James again, that there will be no more money going into the account from my end. Then I requested for a 2nd withdrawal of $1,000 on 4th May. The withdrawal was approved, but then the money was nowhere to be seen as of 16th May. I have requested SecuredOptions to trace this missing fund, so far there is no reply on their end. The grand finale came on 11th May. This was after all the conversations of me not pumping any more money on my end, and the money need to starts flowing back to me. James placed a total of 4 trades at the exact same time, with 2 of them being on the same commodity. This move involved an “All-in” kind of action, total of $19,121 injection into the trade and almost emptied out the account, leaving only $237.50 balance. Not surprising, 3 out of the 4 trades were losses. The only winning trade, which I believed happened only by chance, kept the account alive with $7,449.50. The method of the last 5 trades has shown an unprofessional, fraudulent, manipulative and reckless trading behavior and attitude adopted by James C. Bennet. There is a black and white statement stating that all stagnant money in the account, not involved in any trades, is insured. My suspect is James C. Bennet, or SecuredOptions, is trying to get all money out of the account onto the trading floor, so that minimal money is being tied to this clause. And they are trying to get most, if not all, the money to end up as losses, so that no payout is necessary from SecuredOptions. I have dropped a black and white email to SecuredOptions so called “Compliance Dept.”, “Accounting Dept.” and James C. Bennet to stop trading on my account immediately. Right now, I am asking to close my account and asking for a refund of $7,449.50 + $1,000 (the 2nd withdrawal which is still lost in translation). Still pending reply from SecuredOptions. All contracts, email correspondences, deposit and withdrawal records, trading records are available for verification. SecuredOptions, or the so called Mr James C. Bennet, should be more accurately labelled as a scam artist rather than a trader/account manager. He/They will convince you that you have found a winning formula in making passive income. He/They will smooth talk you, connect with you, share life experiences with you to bond with you and gain your trust. He/They will give you advice on how you should take more financial risks rather than living like the rest of the world. He/They will tell you how stupid it is to keep money in the bank and earning meagre returns. He/They will gradually and gently coax you to part with whatever money you have, and even going for money that you do not have. All the while, showing that he/they is more than capable in making profits with your account. But the moment when he/they found out that you have been completely milked dry, things will suddenly take a turn for the worse. Any successful withdrawals (if any) that you have enjoyed so far, suddenly seemed plagued with problem and money is not getting back to you. Trades placed from this moment onward, more often than not, will result in losses. You will see your account $$$ dropping drastically. Right now, I am giving SecuredOptions the chance to clarify this matter and refund the $8,449.50 due to me. If nothing is moving after 1 week, I will resort to go through governmental and legal channels. Even if I failed to get me money back in the end, I will make sure SecuredOptions will be blacklisted and labelled as scam on as many forums and review websites as I could possible reach. On 16th May, when I was onto them and informed my account manager that I will be taking action against them, and just as I was in the midst of gathering and compiling evidences, SecuredOptions went into my account again and continued placing losing trades. Despite clear email instructions to them on 14th May that no one is to touch my account from now onwards without my permission. They cancelled my withdrawal request of $7449, again without my permission, then placed 3 trades of which 2 are losing trades, and further brought my account down from $7449.25 to $1816.17. Seemed like they are really desperate to zero out my account. I’m consolidating a namelist of all victims. I will formulate a simple questionnaire to derive a summary of the number of affected clients and the common problems encountered. Many of these scammers got away with things cos the complaints are scattered. Hence I will be consolidating the necessary information and submitting to whatever authorities as a petition group. Email me at tommisu@hotmail.com with the headings “SecuredOptions – Scam alert complaint”. Spread the words around to any victims you know or post on any forums you might be on. your are very excellent . your presentation is very clear showing the steps of their plan of scamming. SecuredOptions …… is a pure scam. It is abusing binary options to take money away from you, so don’t sign up! I AM WITH YOU against this SecuredOptions scammer. Is Trade Fusion a Scam? To be honest I had a really good week the first week 8/10 then the second not so good. And the third not reaching its 80%. I thought this had to be legit as I am in Michael Freemans Facebook group where people are having good success. So I am confused of why Michael would endorse a scam. Was he hoodwinked didn’t think it through that it wouldn’t work for everyone? Freeman promotes scams with affiliate links, he gets paid for that. As far as I can work out, most of these Binary Options brokers have their trading floors in Tel Aviv Israel (Here is a very, very interesting news article about this: http://www.timesofisrael.com/the-wolves-of-tel-aviv-israels-vast-amoral-binary-options-scam-exposed/), home also to Michael Freeman aka Emmanuel Matityahu, the originator of several of the autotrader scams including the notorious one I naively got myself reeled into, Neo². I was assigned by Neo² to Bloombex Options as my broker which, if my research is accurate, has its Head Office and FInancial Trading Centre in London UK under the name of Pilpel Capital (https://beta.companieshouse.gov.uk/company/09540034), its website hosted in Singapore, its trading floor in Tel Aviv Israel, and may have been founded in the Seychelles (certainly it has a past “corporate administrator” from the Seychelles). You will also notice from the hyperlink above that its annual tax return is overdue LOL! Of interest is the fact that the above mentioned past “corporate administrator” from the Seychelles is currently “corporate administrator” of BO Investments Ltd (https://beta.companieshouse.gov.uk/company/08518202) which I believe is connected to Banc de Binary, Another interesting piece of trivia: back in Feb 2015 (http://web.archive.org/web/20150212072120/http:/bloombex-options.com/), it was claiming as the address of its “European Support Center” the location for one of the two police stations in Dusseldorf Germany LOL! I consider myself to have got myself pretty lightly out from this questionable organisation. Whether due or not to some facts about the organisation I had at my disposal and which I was able to show that I knew to my contact person I don’t know, but having limited myself to an exposure of USD 87.50, I was happily able to successfully get him to reimburse me the remaining balance of USD 162.50 without any withdrawal charges. And in a friendly and amicable manner too. Happily for me, I have learnt my lesson. However I have read with horror and with considerable sympathy Tommi’s nightmare story about another of these binary option organisations 🙁 I wish you very success in recovering your money, Tommi. When I quizzed my Bloombex contact man about who regulates them, he said their head office is in Germany and so they are regulated by Germany’s financial supervisory authority BaFin, but when I checked online in the BaFin register of companies, I could find no trace either of Bloombex Options or of Pilpel Capital. I questioned him about this by mail (after getting my money back, of course 😉 ) but never got a reply on this one (nor on why their “European Support Centre” had apparently been, back in 2015, in the same building as the local Dusseldorf Police Station LOL!). It seems pretty clear to me that their currrent head office is in London, operating under the name Pilpel Capital (I say “current” as this company was only established on 14/04/2015. I imagine before then they were based in Cyprus.). I phoned the FCA (“Financial Conduct Authority”: the UK financial regulatory authority) about them but they seemed less than useless. To boil down everything the chap said, it came down to: “We don’ t recognise binary options firms and so they don’t come within our purview.” Worse than useless! Basically, if anybody should be stamping down on them, it is the country where their head office is based (the UK in my case) and so where all the moneys go to. These are highly dubious money-making outfits and so they should be properly investigated. However as I said to Tommi, another fruitful avenue is to pursue them in the country where their trading floors are (in other words, where the scammers actually come from and reside! ), which in many cases is apparently Israel. This is going to prove a huge embarrassment to Israel, and be immensely damaging to their reputation once the scale of this scandal gets into the world news. Better for them if this comes into the open now, and is properly investigated. Yes, UK is one of those countries that prefer to look away rather then face it and regulate binary options as they do with every other investment tool. There were some rumours that a new law is being prepared about that, but nothing confirmed. And you can be sure that Bloombex is not regulated anywhere. Fortunately, in my case, I didn’t need their help as the balance of my account was refunded without any problems. I have noticed that you said crunch tech is a scam and binadroid robot is a scam which one do you recommend please help me. Hi, I don’t recommend any robot because all of them are scams. I recommend learning and manual trading. Thanks Muddy3. I have given up hopes to ever recover the money, it’s painful but I won’t die without it. I just want to bring their business down and stop them from harming anymore victims. This will help to quell the feeling of helplessness I have, seeing how these scam companies blatantly go about cheating victims day in and day out, and no one can do anything to them. Slim chance of recovering the money, I have already given up on that. It is painful, but I will not die without that money. I just want to bring attention of their modus operandus to public and prevent more people falling victims. I want to try whatever I can to bring down their business, sad to see that crooks like these are blatantly cheating people out of their hard earned money, and doesn’t seem like any authorities are able to do anything about it. Anyway, contact me at tommisu@hotmail.com, if you are a victim and would like to contribute your case, or if you’d like to know more about how SecuredOptions goes about scamming people. You could complain to the Israeli security and police authorities as it seems that the vast majorithy of these forex and binary option scam outfits are based on Tel Aviv in Israel (see the news article I reference in my post above). The more people who hassle them, the more likely they are to get off their backsides and do something about it. After all (and this should be pointed out to them), this is going to hurt Israel’s reputation REAL bad when people discover where it’s all emanating from unless they get up and do something sharpish! If you have had any email communication with them, you could compare the time you sent your email to the time received displayed on their email reply. That would hopefully establish the time zone from which they are operating. For example I live in a UTC+1 zone (UTC+2 currently because we are in summer time), and I sent an email at 13:42. However I see in their reply that they received it at 14:42. This indicates that they live in a UTC+2 time zone (UTC+3 currently because they are in summer time). Israel is one country that is in the UTC+2 time zone. Next you can communicate with the Israeli authorities to tell them that you are aware that a large number of binary option firms operate from their country (the news article I reference is one piece of evidence you could use for this. I am sure you could find other evidences if you dig deep enough) and you have observed that their emails indicate that they are in the same time zone as Israel’s. You can then go on to ask the question if they have any knowledge of a firm operating by the name of Secured Options trading from their country and explain the scam that has been inflicted on you. If they have evidence that this firm trades from their national territory, then they will have a responsibility to investigate your case (as police representatives in the news article point out). They may then ask you to contact your local police authority and then presumably Interpol would chime in. I don’t know how exactly this would pan out as I’m not an expert on international policing LOL! I wish you the best of success! Such people as the characters you dealt with need to put out of business and their true homes should be prison cells! I opened at account this week with Neo2 and 9/10 trades were losses. Wish I wouldve found this before I invested, now Im trying to pull my money from the brokers and am getting a run around. Both Porter Finance & Morton Finance are claiming my account isn’t verified to pull my funds when they know damn well I submitted all my documents the day I opened. Thanks Mr. John Novak! Can you tell me is MakeMoneyRobot and Binary Option Robot are Scam too? Not going to help much. Their time zone is GMT according to their email time stamp. Seemed like they’ve got this point covered. I suppose you noted that I meant not the date stamp of the mails they had sent to you, but the date stamp of the mails you had sent to them embedded in their replies? I have noticed, I am in timezone of GMT+8, and I’ve noticed they are always online at around 1pm my time. My “account manager” said he is based in London, but he always starts work early cos of his dealings with Asia. But the chances of the whole company starting work at 6am including the online support staff? So Muddy3, you might be onto something there. If I assume they are based in Israel, this would make their start work timing to be around 8am, which seemed plausible. There are class action lawsuits concurrently taking part in both France and the UK and which are pursuing the Israeli-based Binary Options scams. See these articles regarding the London-based law firm: http://www.timesofisrael.com/2500-victims-of-binary-options-fraud-to-sue-in-london/ and http://www.timesofisrael.com/cheated-out-of-e13000-trading-binary-options-a-german-victim-is-fighting-back/ . 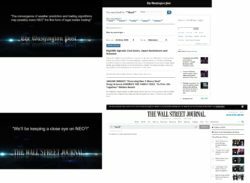 And see this article regarding the Frenchy class lawsuit being led by a Jersusalem-based lawyer licensed to operate both in France and in Israel: http://www.timesofisrael.com/as-israel-turns-blind-eye-to-vast-binary-options-fraud-french-investigators-step-in/ . This is a very much current issue that is gaining traction and is liable to explode onto the world news with potentially devastating consequences for Israel’s reputation. Tommi, seeing that you are English-speaking, I think it would be well for you to contact this London-based law firm. I have also sent this message to your mailbox. To some degree we have ourselves to blame. While Binary Options have been around for some time, trading in them as a private individual has only been made available fairly recently. Greed has made many of us jump into this seemingly easy way of making money, after all it is just call or put, up or down, right? The majority of us look at the little “chart” showing the movement over the last say one to two hours, the curve points all up so we click down or the curve is all down so we click up. That gets reflected in the so called trader’s sentiment or recommendation (which is you and me and everybody else who gambles around on the platform), teasing you even more to make the wrong choice. Fact is: Binary Options trading is interesting and can be profitable, but it requires that you do your homework, learn and keep yourself informed and adhere strictly to a money management policy of sorts. You must watch the news daily, read about general politics, market developments, mergers and acquisitions, changes of CEOs, the NFP, the FED, ongoing elections, the list goes on. Take expert’s advice with a pinch of salt – they are always 50% right and 50% wrong. Stay conservative, 7 smaller trades out of 10 smaller trades won is pretty good, 1 or 2 big trades lost is risking or losing your entire investment/account balance. And don’t forget – professional traders didn’t just walk into a broker’s office as ex plumber or ex nurse, but took years of training, experience and hard work to learn the “trade”. What makes so many of us think and believe we know the markets with all it’s workings? For last: the scammers target us non-professionals, feeding our desire for extra cash and laughing their heads off how easy many of us fall for some seemingly impressive, fail safe fast track. If you get an offer like Neo2 and see that they try to push you to sign up with a broker of their (!) choice, not yours, and this broker has no proper credentials or contact details, wake up and drop it! You would not follow a stranger into some dark side alley just because that stranger is dressed expensively and promises you a stack of free cash if you come along. You would quickly move away sensing rightly that something is fishy – apply this healthy life saving instinct to those dubious online promises too and you are in the clear. The Buffetts and Soros of this world have never and would never consider such online offers for a second – why should you? I am offended by your statement that “Greed has made many of us jump into this seemingly easy way of making money”…not so for myself & my husband. We are Americans, retired and if you pay attention to US news & politics you will find out that those of us living on Social Security & some have a small pension…well, we are terrified of our future. We would be thrilled with $2,000 extra a month. Instead, we must listen to our leaders discuss how they are going to cut our income that is in a trust because we were required by law to have deductions from our payroll to fund this trust account for our future when we can no longer work. Greed has nothing to do with our reasons…just hoping to put our $250 to work and making a little extra each month. We don’t even believe those that promise thousands of dollars every month. So please don’t judge all of us that try to find someway to live in a country that has little use of their senior neighbors. COPY BUFFETT AND AS SELECTING A HONEST BROKER THAT WILL BE ANOTHER PROBLEM. Copy Buffett is just another scam. This is one of the big law firm that is currently taking legal actions against a few big and rampant binary options companies. I have attached the claim form, do go ahead and submit your details, we could possibly take this down the class action road with sufficient victims coming forward, and the legal fees might be significantly smaller than going forward alone. This will only make sense if it is done as a class action suit, the cost involved for individual suit is not worth it. And the fee should be based on commission from the recovered funds (no win, no fee). If upfront fee is involved, then again it is not feasible. My experience with Automatic Trading Softwares is BAD. I have tried the three supposedly best ones – Binadroid, Neo2 and Copy Buffett. Binadroid – After signing up, an unknown broker tried to collect further funds from my card but was stopped by my bank. Sorted but started trading and encountered an interesting losing streak that halved my bank in a day. Considering that £5 trades are allowed, you can imagine the number of losing trades. I then observed and saw how the software was freezing up prices and recording winning trades at expiry as losses. So I stopped. Big Scam. Next step is withdrawal or manual trading. Neo2 – Built up bank to £260 after two days. Then it dwindled down to £220. Then I caught on and stopped trades after 1 win or 2 consecutive wins after a loss. Bank built up to £297 but I guess the software realised and the next 4 trades were all losers. Bank now £197. I stopped too. By the way it only trades EUR/USD. It’s will be surprising if Michael Freeman is really a scammer because I have 80% win rate following his signal group on Facebook. Copy Buffett – crazy. I fell for this because I was told it will be paid for 5% of profits after 1 month. Lost money on day 1. Made it back on day 2. Then lost even more on day 3. I also manually traded to keep Balance at about £250 of starting. Then two days ago, it placed 4 trades – same currencies, similar strike rates and same expiry. Penny dropped. They all lost. Then I manually made it back again. Stupid me switched it on again today and it place two opposite trades to ensure a definite loss (a ‘call’ at high strike rate and a ‘put’ at a very low strike rate on the same currency and same expiry). Luckily the Broker traded on my account without my permission and made £150. Now he’s chasing me to deposit £5000 for vip status account. I’m leading him on until I test withdrawals. He’d be waiting a long time. By the way all the positive review sites must be scams. They didn’t publish any of my negative experiences. Bestbinaryoptionsignals.com, Watchdog, Easytradingsignals.com, Quintup.com. Even MikesAutotrader: obtain a signal, and for the same price/SR and expiry, you get opposite signals, and this is just 30 seconds apart. I’m just testing out which of these software I can consistently reverse/opposite trade for profits. It seems to be working to some extent. Hmmm, what I’ve noticed about NEO2 is how mine doesn’t seem to trade at all. It was on while 100% Trades were indicated and didn’t pick any of them. As for the Copy Buffett reviews – yeah, I found my Observations weren’t published either! The so called ‘reviewers’ are obviously stooges while maybe some of it works like a Pyramid Scam. That small group of people continually touting for Money from the others, all of them promoting each other in the process. Mike Freeman slags of Binary Options Robot.Com but not only do I wonder what his motive is now, I also think it’s a shame that what might be one of the only genuine Autotraders is currently offline having technical problems. Greed on my part? I never got into this to become rich, just trying to get a few quid together – have some financial independence. Did you see the results of BinaryOptionRobot.com? Fortunately they are honest and they show that it is losing money. Where do u see it says they r losing money? ? Look at the screenshots in the Binary Option Robot review. Hello All, I am on this forum for the first time and I am based in the UK. With my experience so far, I can assure you that there is not broker that does not exhibit some elects of fraud in their operations. It does not matter whether they are regulated or not. I have tried several brokers and have not found one that could pass the test. The authorities cannot do anything about it because like Tommi said, complaints are scattered (so authorities do not have sufficient evidence to work with). Again, those brokers that claim to be regulated are registered in countries that will make it impossible for law enforcement in your own country to help you. Be Warned! I have had the same experience with NEO2 as the above comments, fortunately not much money was involved! But I was well and truly fleeced by a company called OptionFM. They went out of their way to gain my trust. The really appalling thing they did though was to get me to share my screen with them, so that we could supposedly see each other over Skype. When I commented that I couldn’t see them, they made excuses for it. What they really wanted to do was get me to withdraw money, so they could see into my bank account, to see how much I had! I feel like a fool now. Has anyone else had a similar experience and do I have grounds for legal action? There are reasons why they would like to see your computer screen. But the bottom line is yes, they wanted to know how much and how far they could scam you. The only viable option is to initiate a chargeback if the deposit is by credit card. Else you could do what I’m currently doing, engaging a private investigation firm to locate them, then get a law firm which is based in the same country to serve them a legal correspondence personally. So are there any actual binary robots that work? And for people in the U.S.? Hi, unfortunately I don’t know about any. So, is there any binary options software/bot not a scam in the industry? I don’t know about any profitable software. If you check out Tech Crunch, you will find that it is almost identical to Neo2. Weather satellites and all that good stuff. Being a newbie, I signed up with CTOptions. I have not been bothered by any managers to up my stake and I have not attempted a withdrawal. My first attempt to get a Crunch Tech account landed me with Berkley Capital. An obvious scam, it states that it does not allow more that 200 units of currency to be withdrawn. Fair warning to you all. There is another scam alert site which mentions that Neo2 and Tech Crunch, as well as a number of other scam signal and binary brokers, are all hosted by the same provider. Possibly in Israel? I don’t have the link unfortunately. My manual results with Tech Crunch have been average, 50/50. My first day, being excited, it traded every signal, stocks, currency and commodities. I had an overall losing rate and the most losses occurred in the stocks and commodities. So the next day I had 34 high/low trades at 10 or 15 minute expiry. I won 17 trades and lost 17 trades. I have tried the Auto Trade for short 2 or 3 hour intervals with no trades made. Could it be the the binary brokers are sending account trading information to the signal providers? Without regulation, I can see that happening. I am going to open an account with Nadex and step into the real world of binary options. which was posted to the internet literally just 4 hours ago. MoneyNetInt – coincidentally today or yesterday they took down Lbinary and NRG Binary. By the way nobody asked us to remove comments that you mentioned. MoneyNetInt – Thanks for the update about them. Good to hear about the good Israeli guys fighting the bad Israeli guys (and there are far, far too many of the bad ones at the moment using these monstrous Binary Options scams) . Lbinary.com has been gone for at least 2 months. The article is wrong. I can guarantee you that the site was gone about 2 months ago. I tried it from the states and a friend tried it from overseas. Unless that was a temporary condition. But all of my friends who had LB accounts noticed their balances changed to zero shortly before that, through no action of their own. this site is a big scam too cause i know that neo2 works good. you just against michael an co.
You will never do better than putting in the hard work and learning to trade yourself. In life, your rewards are often linked to how hard and how smart you work. If its easy and sounds too good to be true, then it usually is. I personally would never trust any ‘Auto Trader’ that is linked to a binary options platform….and for one simple reason. Binary brokers only really make money when we loose (its in there interest for us to loose). If you run a business that relies on people loosing to make money, why would you allow software on your platform that is going to put a serious dent in your profits? Think about it! It simply make no sense….and for that simple reason I’ve never been tempted to use any auto trader software. If you learn to do it yourself you’ll have a skill for life…it takes time, and effort but it can be done. which binary options robots are not scams? pls introduce some good websites about it. I’m afraid there are none. same story like you people have first gaining trust, asking more money to put. Even after risk free secure trade lost in FM trader, broker called me & told me you going to see your money in your account next day, than after no one is calling, no one replying back emails. online chat they always says don’t worry, your broker or head broker will contact you soon. I got called from The Offices of Birman Law, she explain like all company working in Isreal. thing is they ask 10% upfront fee to recover that money, than after 20% (so total of 30% of your investment money). what are your suggestions people ? Wealth Recovery International doesn’t look like a legit company. The website was created this year in June and info about their licence is missing. They provide legal services, so they have to have a licence. Did you go further with Birman Law? I am also thinking about using them but have concerns about whether they are legit. How long was the process with Birman law? Did it take months, and how large of a sum was your recovery? I’m also skeptical of shelling out more money to a company that I don’t know whether I can trust, but looking for legit possibilities to recover the thousands of dollars stolen by EQT Finance. I also know over 20 people scammed by EQT finance.